Location! Location! Location! Gorgeous Double Fairway Views and Lots of Sunshine! Lovely two bedroom, two bath 30 plan at Rancho Las Palmas Country Club with large family room/office and trundle bed making it comfortable to sleeps six. This vacation home has a spectacular double fairway view from the back patio and with a Northeast exposure, you are sure to get plenty of morning sun! With seating for six, it is a perfect location for dining al fresco while watching our beautiful sunsets. 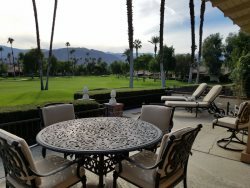 Located close to a pool and spa and at the front of Rancho Las Palmas within walking distance of The River, the Rancho Las Palmas Resort and Spa and the clubhouse … a perfect location. The great room has a large sectional sofa ideal for entertaining family and friends and a large flat-screen cable TV. The dining room provides seating for six and in the kitchen there is a small table that seats four for casual dining. The kitchen has updated appliances and is well stocked … ideal for entertaining guests and family. The master bedroom has been furnished with a comfortable king bed, flat-screen cable TV and has a private updated on-suite with walk-in shower. The guest bedroom is furnished with a queen size bed and flat-screen cable TV. The guest bath has been updated with a walk-in shower. There is no bathtub in this condo. The Den/office doubles as a third bedroom and is furnished with a trundle bed that becomes two full size twin beds with doors that can be closed for privacy. There is also a cable TV and desk making this room a very usable space. This lovely vacation home also has Wi-Fi and Free U.S. and Canada calling.